Captain Fred's Boat Tips- Is The Marine Industry Changing? IS THE MARINE INDUSTRY CHANGING? The marine industry has been changing the past few years and those trying to determine the direction it is going are simply speculating. I have a theory, but like all the others, mine is just a guess. I’ve been watching closely for several years as the changes that are occurring now have advanced. What is happening in the marine business is similar to what the housing and real estate markets experienced. There is no stability and no accurate way to forecast the future. Mega yacht buyers and sales people seeking the big commissions convinced some of the older boat builders the large yachts would be the industries savior. This approach proved to be a bad idea. Many of the big boat manufacturers are, or will soon be, in trouble. The housing slump resulted from the fact multi-income families came and went with their eyes closed. They not only bought the mammoth homes but had to have all the toys to go with them. Four cars in the big driveway including a fancy pick-up, an RV for the pick-up to tow, vacation home on the lake and of course boats and jet skis. After buying the big house, everyone wanted a big boat to match their big cars and pick-ups. The marine industry followed the lead the real estate market and “toy” manufacturers set. They began competing for some of the extra money being thrown around. 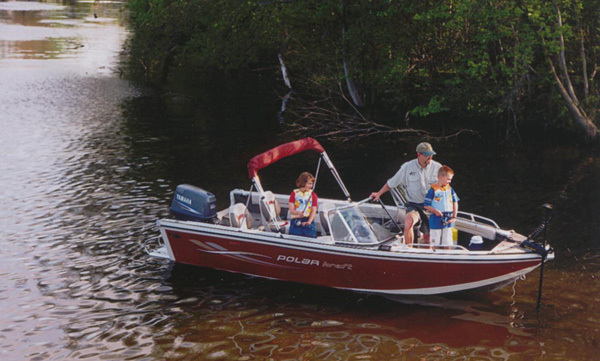 In just the past few years many small boat builders introduced larger models thinking they could get a bigger piece of the pie. I am aware of 2 or 3 that went from 20 footer’s being their largest boat to 34 and 36 foot vessels. Some even had to build new facilities to make the larger boats. The research behind the move to bigger boats flooding the market surely was skewed. It seems that almost overnight the industry has changed. Not unlike the auto industry, it could have been seen if anyone had been looking. Another factor that influenced the market was the introduction of foreign boats and motors. Like all the other industries in our country, they joined the masses competing for the U.S. paychecks. Some U.S. manufacturers saw the foreign builders going for the mega yacht business and instead of looking beyond the bow, jumped right in. Instead of putting their dollars into a greater quantity of boats that people could afford, they invested huge sums into building a few mega yachts that only a small number of people could buy. No one paid any attention to how fast we were headed the wrong way. If one were to stop and take a good look around, a few lessons could be learned. When home foreclosures first started, small homes were affected and most were older. Soon bigger homes began to join the falling market then the auto and banking industries were hit. And during all these events, the marine builders continued blindly to produce the mega yachts. It would seem if many major industries are backing down, eliminating overtime, cutting employees, eliminating bonuses and not funding many employee benefit programs, the word would get out. Where will the money come from? Who will buy the mega yachts? How many lotto winners could there be? Bank managers, small industry CEO’s major industry upper and middle management workers are all cutting back. We are witnessing HARD TIMES in many areas and the bottom rung on the ladder is much closer to the top than it was just a few years ago. Few marine industry leaders want to accept the above scenario and I may have difficulty getting this commentary article published but it is time to reflect on reality. Sure the new facility turned out a multi-million dollar boat and it sold right off the line but will the next one and the one after that sell as fast? And – how many must be sold to pay the cost of building a new plant and re-tooling? As I remarked earlier speculation and guessing are being used in lieu of facts so I will offer my guess. It will be much easier to sell 100 small boats in the 18 to 22 foot range, or even smaller than to sell a $1,000,000 plus yacht. From a buyer’s point of view, they must consider all expenses that go along with boat ownership; insurance, dockage, maintenance and the whopper – FUEL. Even the wealthy are looking at these considerations. There are few boats moving on the countries waterways – most are dockside with For Sale signs hung on them. I hope I am wrong, but after talking to many boat owners, I have learned they are trying to do what I’ve done, down size or leave boating altogether. Those that remain and new boat buyers will likely go back to the days of trailering. Which calls for another observation; trailer boats need a husky tow vehicle, unless they are a smaller, light weight style. I believe in the not too distant future the 15 to 20 foot aluminum boats with 40/50 HP outboards will become the choice for regular fishermen and women and those just getting into boating. They will be affordable, use much less gas, be easy to maintain and move around plus cost little to insure and store. Many such style boats will easily store in the garage (the extra vehicles are gone) or can be canvas covered and kept in the yard. The boating industry must follow the path the auto industry is taking by downsizing. It will be the key to survival and future success.